Jyväskylä is about 4 hours drive from Helsinki and so I’m told the heart of a technical area where a lot of Nokia is based, so it was kind of fun to show off the Nokia X with Delphi App running that I picked up in Barcelona. 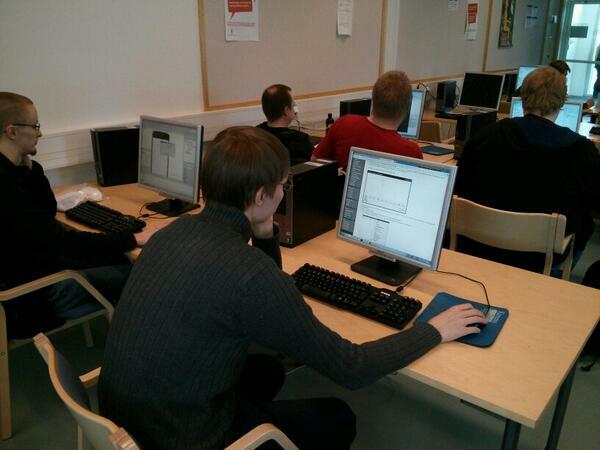 The lecture was hosted both in the university and streamed live and was the follow on to a number of sessions run earlier in the year by Juha Piispa from Moonsoft. After the lecture in the morning I had the pleasure of lunch with the dean before looking at some really old hardware, including what I was told was Finland’s first super computer and a massive IBM hard drive from before I was even born! Kind of geeky cool; before heading to the labs, where we had not 1 but 4 labs booked out (around 50 PCs) with students working together through a number of tutorials on http://docwiki.embarcadero.com learning about Visual LiveBindings, FireDAC and also the base language capabilities before running the output to both Windows preview and Android emulators / devices. Unfortunately, I was so focused on what I was doing I forgot to take a load of pictures! Are you sleep walking into XP end of life? Today I came across an excellent blog post by Simon Rice from the ICO looking at the business reasons you and your customers need to look to get off XP. Microsoft XP goes end of life on 8th April. If you are still developing on XP and on an old edition of Delphi of C++ Builder then now is a great time to upgrade with special offer running to the end of March for those on any old edition. 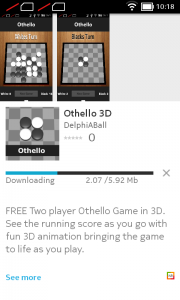 For more about the latest offers on RAD Studio, Delphi and C++ Builder, including a current promotion of 50% off the mobile pack for XE5 then visit http://www.embarcadero.com/radoffer now! Following on from my last blog post about the development of the 3D application created using Delphi Programming for iOS, Android, Windows and Mac from the same code base, I am now happy to confirm that the application is submitted, accepted and live on the Nokia App Store. Nokia’s new direction seems to be to focus on earning money from the backend services serviced by Nokia and Microsoft. In a similar way Amazon took a base version of Android and added their own store etc, Nokia have done something very similar with then new phones. They have also gone to the length of wrapping a number of 3rd party API’s to their own services to make it easier for developers to migrate over to the Nokia store. This should solve the issue of developers not targeting the Nokia phones (due to WindowsRT) and will allow a great phone manufacturer to regain market share and value. Honestly, I was surprised how easy it was to get the app published. 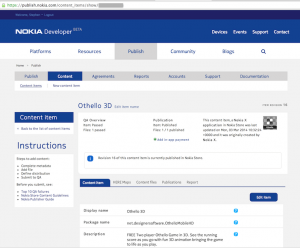 To publish onto the Nokia app store (ready for the Nokia X being sold) you need to setup an account via http://developer.nokia.com/. You can also easily check your APK compatibility by uploading your APK file onto the website and get immediate feedback which was great (but not this is not acceptance of the app, just that it seems to be compatible). The hardest part of submitting my application was actually creating the icon and having to get screen shots in the right screen resolution, but this was easily solved with a device to hand by just running the APK on the device. 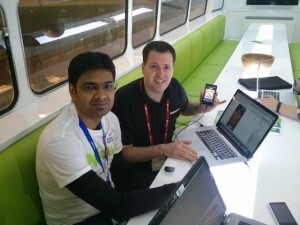 Here is me doing this last week at the mobile world congress in Barcelona on the Nokia bus (note the Android Green colour scheme lol). Following on from the initial submission, there is then a review process at Nokia that hopefully results in acceptance emails being sent over to you and your application shows as submitted. 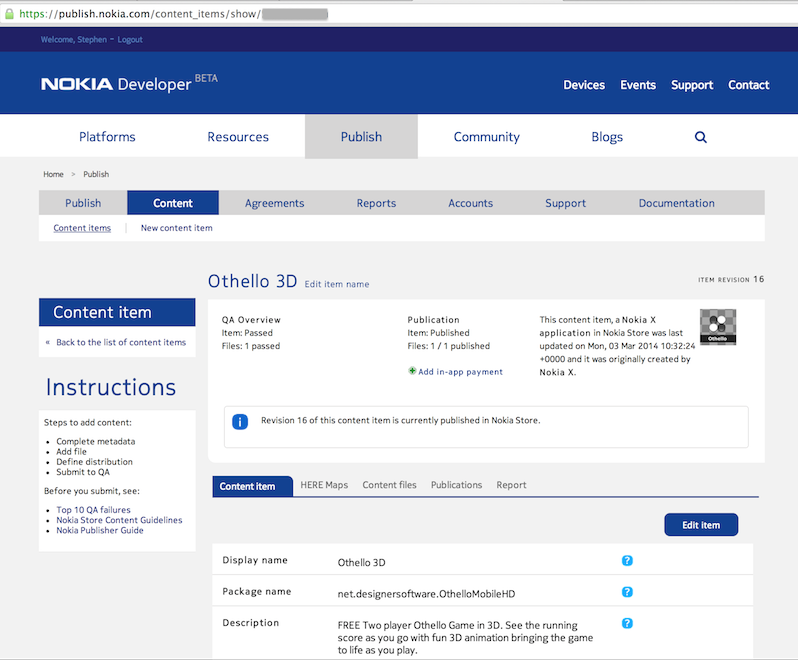 The Nokia development portal online is easy to navigate and under published content you can see the details of your submission and the current state of review. Once approved, you can then use a Nokia X to download the application from their store. I think that as the store is in Beta right now the links are not publicly visible, but as soon as this goes live I will post that link up. Anyway – As you can see I downloaded the approved application from the app store and by using the power and volume buttons was able to get a screen shot. I actually really like the Nokia X from first glance and I think its going to be a great (budget) phone, and the choice to use Android under the Windows Tile look and feel is a great move to gain share and developers to use the services that make the money behind the scene and help people get used to the Microsoft driven style. The process of posting the application to the store was relatively simple and painless, but I was not using any advertising or anything else so I can’t comment on the experience of doing this, but over all, so far so good! Will be really interesting to see what this means for the future of Windows Mobile, but right now: Nokia + DelphiApplication := Shipped!